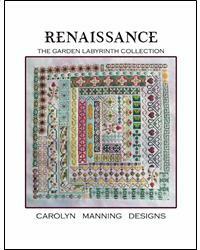 Renaissance inspired motifs abound in this garden labyrinth. Recommended threads are Gentle Arts Sampler threads. There are some french knots and Algerian eyelets in this design, all whole stitches and backstitching. Finished stitch count 153w x 153h. Project Size: 11" x 11" on 14ct.